Today Love Saves the World welcomes Ann Montclair who is currently on a book tour for her book, Lady in Deed. Ann will be awarding a $30.00 Amazon GC to a randomly drawn commenter during the tour. Piety or passion... What’s a lady to do? Lady Mary Rutherford believed she would live her entire life as a nun. But when King Henry VIII’s reformist movement makes practicing religion a dangerous proposition, Mary is forced to begin a new life with a family she doesn't know. Worse, she must become lady of the manor, a role for which she feels sorely unprepared. After a decade of service to his king, Lord Trenton Stanley returns home to find his estate in ruins, his fortune depleted, and his doddering father drooling over Mary -- a woman Trent fears has been installed to replace his mother. Trent strives to rebuild his life, but his desire for Mary becomes a serious distraction he can’t seem to ignore. He wanted to reach out and touch her soft yellow hair, move it from her proud shoulders, and hold her closely. Her outrage evoked a strange tenderness in Trent, but also bitterness. Who was this chit, and why did she act like he’d done her harm? They rode in his coach with his driver, and she was, what, a guest, a ward? An unwelcome one if she kept glaring with those icy eyes. Trent couldn’t help it. He actually found her unbelievably attractive, even if her gaze promised no reward. “And you are my ward? How so? Do tell, my ‘lady.’” He exaggerated the last to reinforce he doubted her assertion. His lifted brow named her a liar. The woman drew a deep and ragged breath, and pounded on the coach top to indicate to James this journey had come to a most unfavourable end. As the carriage slowed to stop, she flung the door wide, and escaped like a songbird from its cage in one swift movement. The snow had subsided, but the accumulated flakes softened her landing. Her little satin slippers proved no match for the slushy stuff, and her whole body shifted and sagged onto the frozen earth. Trent bounded to her side and hoisted her rigid body into the coach. Trent set Mary upon the carriage bench with care. She slumped onto the seat and pulled her feet under her like a curled cat with claws finally retracted. With the rich fur he gently placed over her shoulders, she seemed small and vulnerable, but the rosy lips and flashing eyes revealed a fire within. He attempted a conciliatory smile, but her round eyes narrowed, and she sniffed and turned up her nose. She would not be mollified much less appeased. Was the little temptress ward to his father? Trent cringed with embarrassment that he had violated her with much vigour. Passion had clouded his judgment. “Damn this to hell!” His temper exploded. Her words sounded more curse than blessing. Lady Mary continued stiffly as if Trent hadn’t spoken. “I assure you my leave was due to the state of the kingdom and not any wrongdoing on my part.” She shook her head as if scolding a naughty schoolboy, and she caught her lower lip between her teeth, staring at him with frank puzzlement. He was struck by the innocent yet sensual gesture. Mary turned her back, and before he could elicit more information or explain his honest error, the coach stopped again. They’d arrived at his family’s estate. Ann Montclair writes contemporary and historical fiction and is an English professor at a small, rural community college. She was born in Los Angeles, California, where her parents and grown daughter now reside. Ann currently lives in the Finger Lakes region of New York with her husband, son, and a pile of dogs and cats. She enjoys listening to live music, hiking, cycling, cooking, and gardening. She hates dieting but spends a lot of time ruminating on the topic. Her biggest wish is that each of her readers will be inspired to believe in and find their own happily-ever-after, no matter their fears and insecurities. Her motto is Love triumphs! Ann has three published contemporary romance novels: The Billionaire’s Bauble (Soul Mate Publishing 2011), One Wet Summer (Musa Publishing 2012), and Good Things Come in Tall Packages (Musa Publishing 2012). Lady in Deed (Musa Publishing 2012) is her first historical romance. 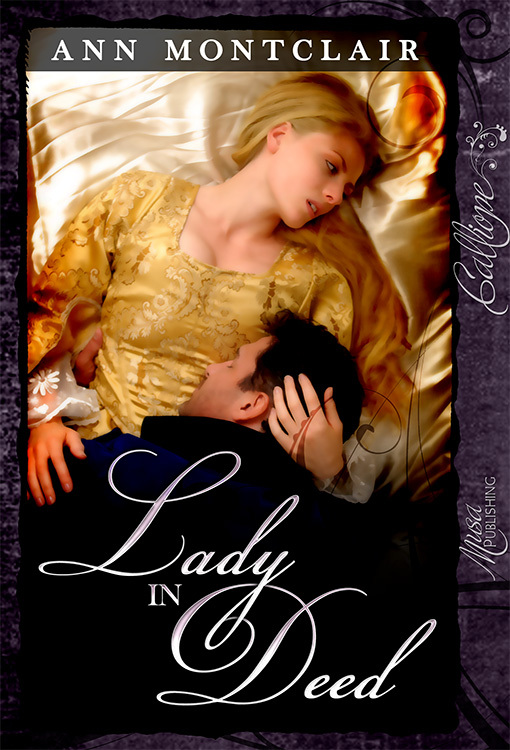 Lady is the Law, another Tudor historical romance, is forthcoming 2013. Nice excerpt, is there something you dislike about being a writer? Sounds great, will there be a sequel? Lena, the only thing I dislike is the pressure to sell books. I'd love to write and never have to think about sales, but unfortunately, self-promotion is part of the job. Thanks for your question. Emiliana, I have no sequel planned as yet. I am working on another Tudor era historical, but it's set in an earlier time--1485 vs. 1533 in Lady in Deed. I appreciate you asking. Is there a book or author that you admire? I love regency romances. This one really sounds excellent. This is a wonderful book and I wish you much success with it. Am looking forward to more books from this tallented writer. Ami, I'm pretty attached to Mary. She is thrown into an impossible situation but manages to gain the upper hand. She's a dynamic character who learns she's got everything it takes to be whatever she wishes. Anzu, I read and admire so many writers. Philippa Gregory is my favorite historical writer, and she is probably the biggest influence for this particular novel. I've seen this book around on a few blogs and that cover looks epic. I love historical romance. Your book looks very interesting! Thanks for this nice giveaway! I can only imagine what it must have been like. Burning to touch that person and not being able to do so. Sweet torture. I can only imagine what it must have been like back then. Burning to touch that person and not being able to do so. Sweet torture. Thanks for posting! I'm getting really excited about your book! Things just sound better and better!